"Harris Tweed is cloth that has been handwoven by the islanders of Lewis, Harris, Uist and Barra in their homes, using pure virgin wool that has been dyed and spun in the Outer Hebrides." 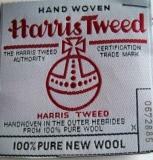 This is the official description of Harris Tweed, as defined by Act of Parliament. 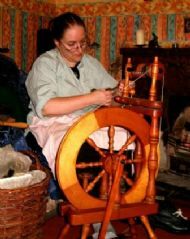 It was in the mid-nineteenth century that the Dowager Countess of Dunmore - widow of the first non-native proprietor of the island - encouraged the people of Harris to improve their techniques for producing homespun cloth. 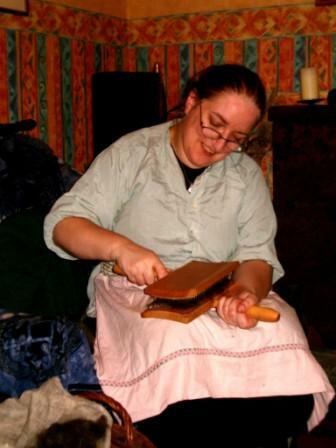 She put the cottage industry on a commercial footing, giving a great boost to the local economy. Certain operations are now done by machinery, but in former times, of course, everything was done by hand, often to the accompaniment of song. Spinning, for instance, is a long, tedious process. What better than a song or ten to pass the time? 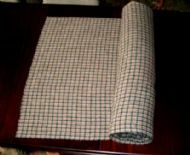 Below is a summary in pictures of how Harris Tweed was made. Clicking on a picture will usually bring up a larger version. 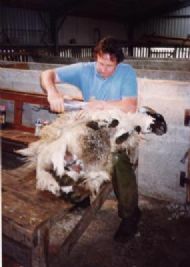 John likes to clip by hand in the old fashioned way. Not easy with a reluctant sheep! Waiting their turn. Don't they look proud of themselves? Not your average scruffy Blackfaces! 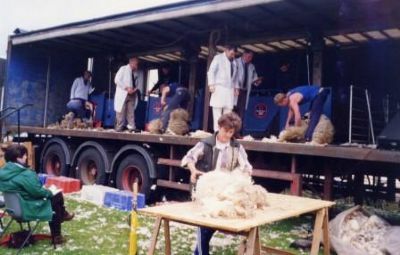 Sheep shearing competition at the Portree Agricultural Show on the Isle of Skye. It's always sunny at the Portree Show! Innes cards the wool to tease out the fibres before spinning. In the first quarter of the twentieth century carding and spinning mills began to take over these laborious tasks. 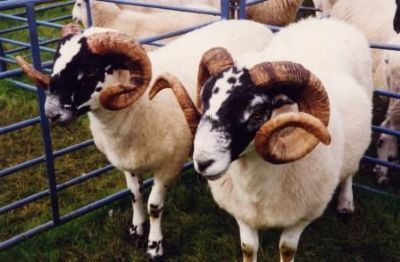 The wool was dyed, using natural materials, mostly derived from plants. Innes is our expert on spinning and dyeing. Here she is, spinning a yarn! Innes uses some of the old methods of dyeing, and experiments with plants from around her home. 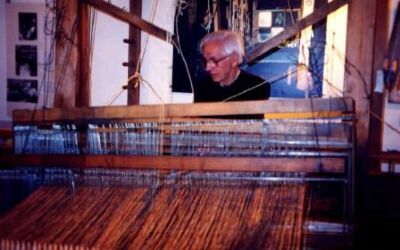 Donald weaves on a wooden-framed handloom of the type which was once in common use throughout the Islands. Unfortunately, we can't manage to lug a loom around with us when we are performing! But we can sing a song about a loom. 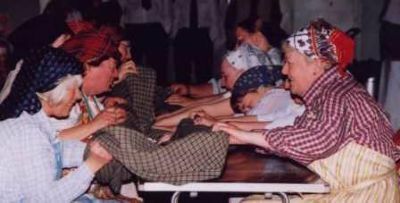 Waulking - we do it for fun, but it was hard work. Myra has either collapsed or is giving it her all! Our tweed was woven by John MacMillan on the island of Lewis.